Unlimited Phone and email support ~ Once the client has been obtained, I will be available via phone, text, and email to answer any questions or concerns. Immediate Breastfeeding Support ~ Help for the mother and baby after birth, establish a good latch in the hospital before leaving them. Essential Oil Use in labor ~ Diffusing with the consent of client and hospital policy. Bath salts, hand and foot massage will be used with essential oil infused creams and lotions if desired. I am pleased to announce that I have recently joined a collective of doulas. 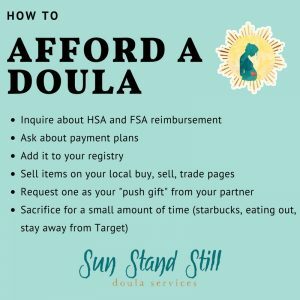 If you’re interested in a birth doula consulation, please follow this link to schedule a free, one hour consultation and learn more about the team.